Are you locked out of your house or apartment? Do you need to unlock a bedroom door in your home? We proud to offer residential locksmith services in Easton, Bethlehem, and Allentown, PA. Residential lockout services in the Lehigh Valley provides by LockTech24/7 guarantees fast lockout service, as well as affordable rates. We cover all types of residential lockout services, whether external door or internal door. Our locksmiths work 24/7 in order to provide you with residential lockout services, early morning or late at night. It’s our locksmith service quality and reputation that keeps our loyal customers returning to LockTech24/7 Locksmiths, time after time when they need emergency lockout service. There are plenty of other residential locksmith services we can do for you. As a matter of fact, our full suite of residential locksmith services goes beyond house or bedroom lockouts. For instance; we re-key locks, as well as repairing, and replacing all types of locks, as well as installing keypad locks, or making fresh installation for adding a deadbolt on your door. We are lockout specialists for houses and apartments across the Lehigh Valley. Our locksmiths can unlock any residential door. It doesn’t matter if you need to unlock a main door, bedroom door, or garage door. It also doesn’t matter if you locked yourself out of your shed, basement or safe. We do not recommend to break a window our of desperation or frustration. This will cost you much more, in the long run, than calling our local locksmith techs to unlock your door. 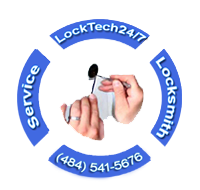 LockTech24/7 Lockout team is dedicated to servicing our customers 24 hours a day 7 days a week. In this matter of emergency lockout service, we can help you any time, day or night. One of our locksmith technician can arrive at your home in Easton, Bethlehem, or Allentown within 20 minutes of your call, equipped with all lockout kits & tools necessary to unlock your door in a fairly time frame. We take pride helping our customers any time they need help from our professional and fast locksmiths in Easton, PA. Our locksmiths are committed to excellent customer service, as well as customer’s satisfaction. In addition, our services are unsurpassed in terms of quality, cost, and speed. If you need help unlocking a door in your home, you can call us right now for a fast response. We guarantee to be there as quick as we can.When you need lock picking service, we can definitely help ! Front door of home or apartment – This is one of the most popular house lockout service. The main door of your home is one of the most used door in the house. Bedroom Door Lockout Service – In many house, also the bedrooms has locks with key. You can find them especially in student apartments or roommates. Don’t spend a night on the couch, you can get your privacy back soon after calling us. Patio door unlocking service – When you have a lock cylinder on your patio sliding door, it might be easier to pick its lock than the front door lock. Garage door lock pick (above the head) – Most of above the head garage doors has a T-Handle lock. Other garage doors has rim lock. We can easily pick either lock of a garage door. Shed Lockout – Also most of sheds has T-Handle lock that can easily be picked by our locksmiths. Perhaps, there are work tools inside your shed that you need in a daily basis. Please call us, as soon as possible. Safe Opening Service – This is not a standard residential lockout services, but, we can help, too. We can unlock any safe up to medium size of 3ftx3ft. Door knob unlocking service – When you have one lock on your door, this is a door knob. If you have two locks on your door, so a knob is the bottom lock on your door. We can unlock any door knob, whether Kwikset, Shlage, or Defiant. In fact, it doesn’t matter what brand name is your door knob. Deadbolt lockout service – A deadbolt is the top lock on your door. Usually you can not lock yourself out of a deadbolt, unless you’ve lost the key or the key broke to two pieces. We can unlock your deadbolt by picking it, don’t hesitate to call us. Entry lever lockout service – Entry levers are also placed at the bottom. This is a different locking system than a door knob. It might be a little bit harder to pick an entry lever than a door knob, but our pros can easily unlock your entry lever lock. T-Handle lock opening service – A very popular lock sheds out of your backyard, or for above the head garage doors. T-Handle lock should be very easy to pick, we can unlock it for you. Rim lock picking service – You can usually find a rim lock for residential properties on above the head garage door, or a door with Night Latch locking system. Mortise lock picking service – This type of commercial lock is usually to be found also on old house from the middle of the 20th century. In many cases, the original lock is still on the door since the time the house was built.